Bibliography: Bartsch 1; Joseph Meder 1, 2b or 2c but without wiping scratches through ibex, upper right, or on Adam’s thigh and hip. 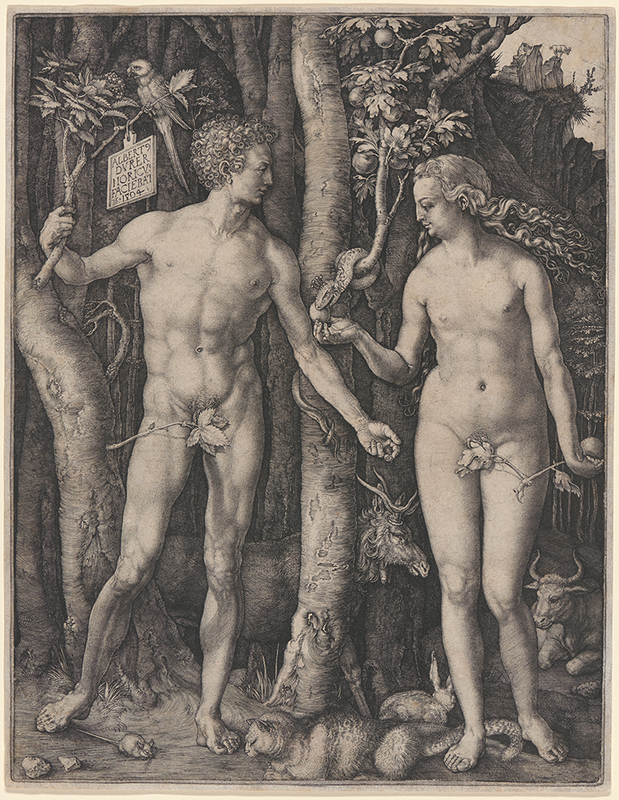 Adam and Eve, . Engraving. Fourth state (second finished state). Plate: 250 x 193 mm (9.8 x 7.6 in.). Sheet: 254 x 197 mm (10 x 7.8 in.). DAC accession number 1991.33.1. Gift of John E. Andrus III (B.A. Wesleyan 1933), 1991. Open Access Image from the Davison Art Center, Wesleyan University (photo: R. Lee). http://dac-collection.wesleyan.edu/obj5097 is a persistent link to this page with no user-session information.